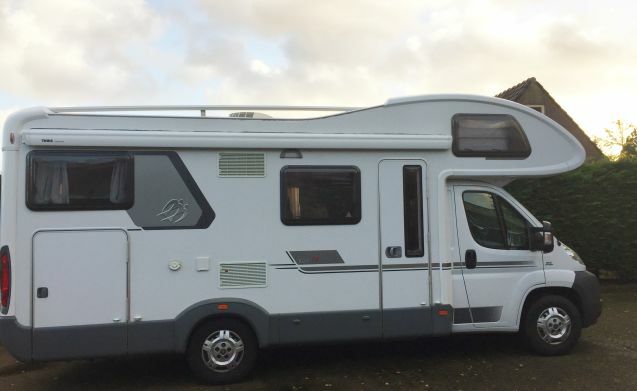 Fine reliable camper with powerful 3.0 liter engine to go along with. 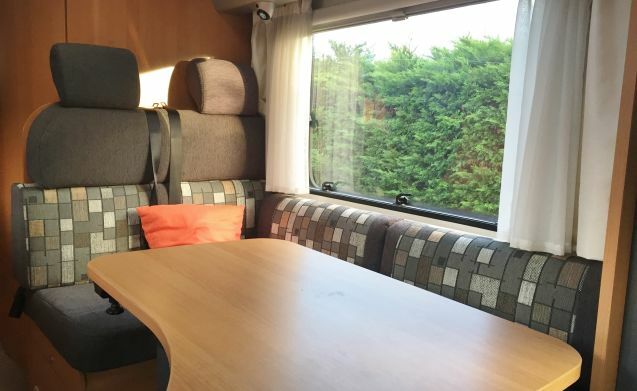 The headroom in the camper and all beds are perfectly suitable for people up to a length of 2.00 m.
The front seats are rotatable and the table can be adjusted in 3 directions so that you always have a spacious seat. The cupboards in the kitchen (see photos) are deep and therefore the counter is also nice and wide. 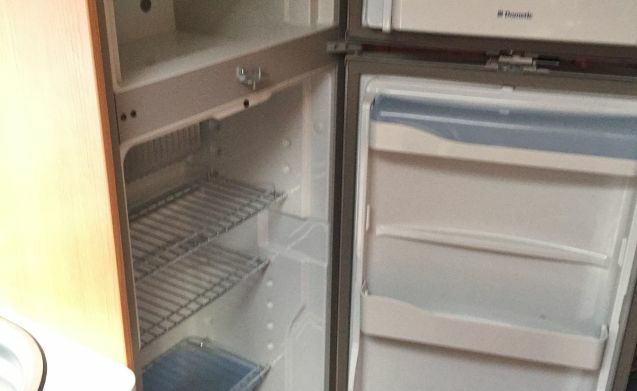 Above the refrigerator is a large freezer compartment, there is a large open storage space above. 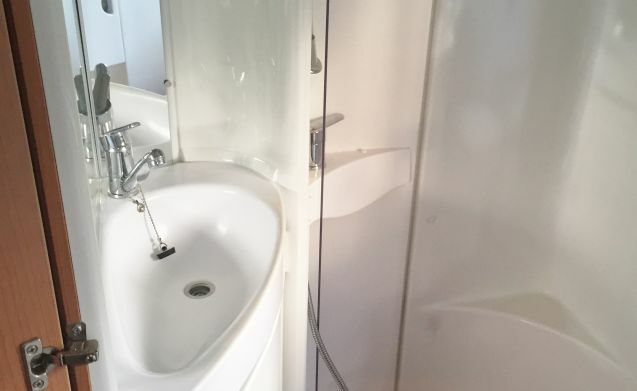 Next to the fridge is a wardrobe and opposite a bathroom with toilet and sink. 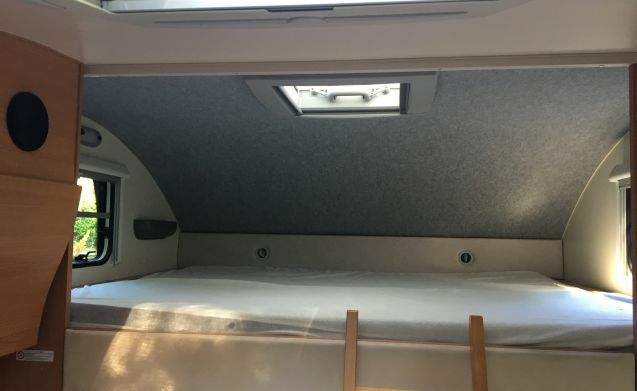 The double bed in the back is in the width of the camper with a large window at the head and foot end so that there is a lot of ventilation in the summer. 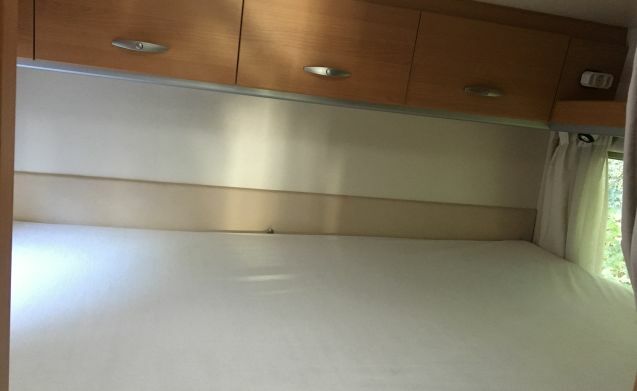 The wide bed in the alcove consists of 2 single mattresses. 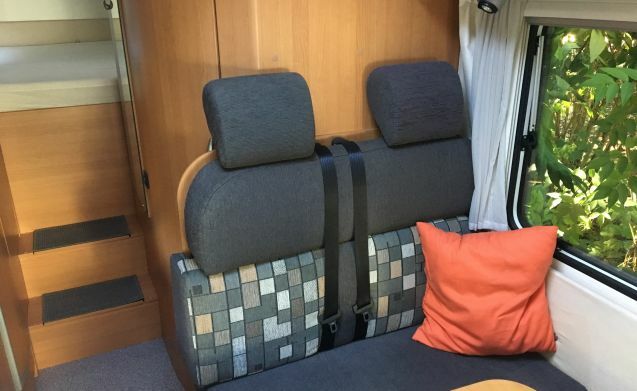 On the pictures you can see that the front seats can turn and that the upper bed is foldable so that there is enough headroom at the front seats. 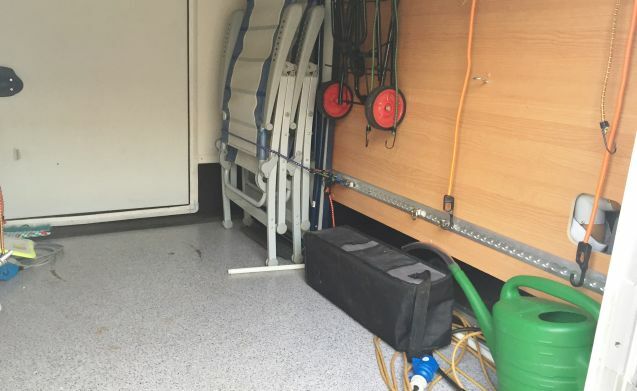 The camper has a large storage space in the back, so large that it is even called garage in this type. At the facilities we have indicated that there is a bike carrier but by that we mean that there is space in the garage for at least 2 bicycles. Of course there are also a table and 4 chairs in the storage room ready for you to be put in front of the camper. 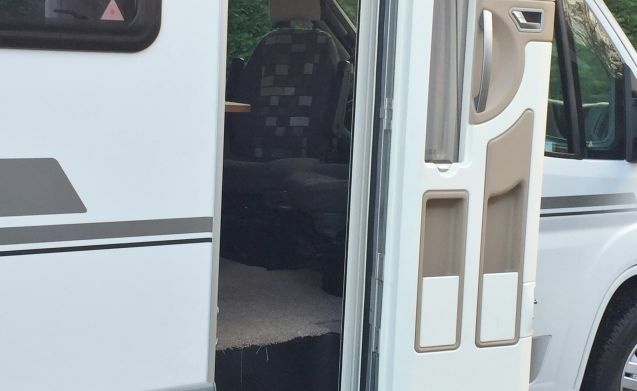 On the side of the camper is an easy-to-turn awning which is fixed with 2 uprights. 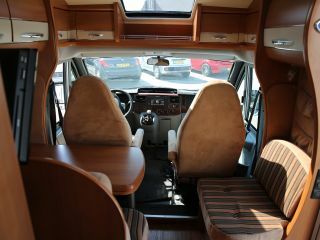 The camper is equipped with a camera at the back. It works not only when reversing but also when driving forwards which is a useful help in estimating the space if you want to re-insert after overtaking. 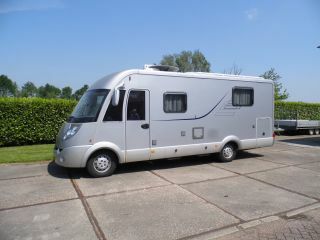 We are enthusiastic motorcyclists and often use the motorhome in combination with a motor trailer. A motor trailer can also be rented. If you also have such a thing in mind, talk to us about the possibilities. 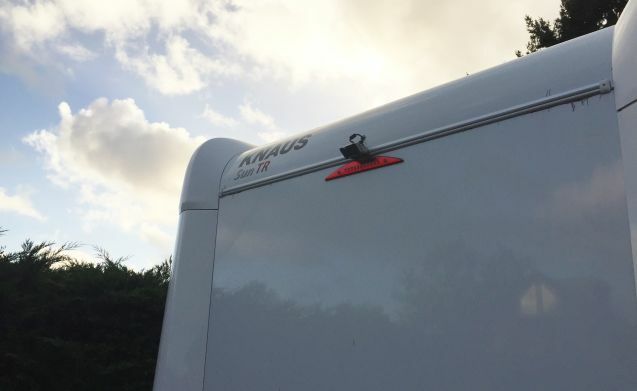 The motorhome is delivered as standard without a towing hook. If you would like to use it, this must be reported immediately with the application with a description of what you want to connect. We would appreciate it if, when picking up the camper, you have time to view everything together and explain it where necessary. There is an opportunity to park your car with us during your trip. Of course you are also welcome to view the camper first, by appointment. 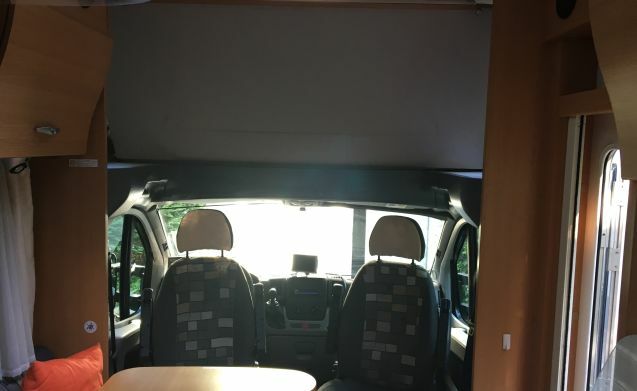 SPECIAL SERVICE: for those who do not like driving, but would like to camp in a spacious camper, we can transport and install the camper for you at a campsite in the Netherlands, Germany or Belgium. - It is mandatory to always use the Bearlock (gearbox lock) when you park and the key must never remain in the camper. - You can only stay overnight at campsites or official camper pitches. - In case of breakdown or damage, you must contact us directly. 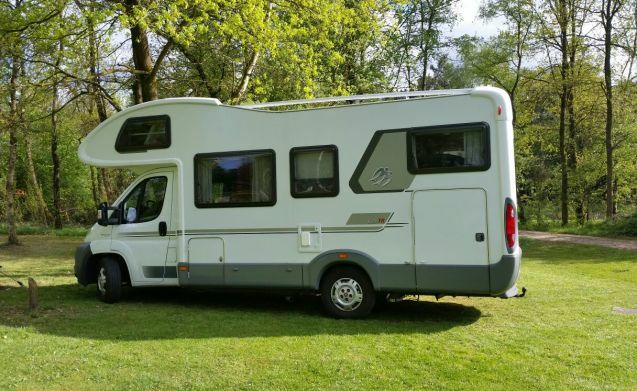 - The number of the driver's license must be passed on, other people are not allowed to drive the motorhome. Response from Fam. Heel fijn dat jullie het zo naar jullie zin hebben gehad. Wat een prachtige reis hebben jullie gemaakt. Gelukkig is het inmiddels mogelijk via GoBoony om het eigen risico voor het grootste gedeelte te verzekeren. Dat zou ik dan ook iedereen willen aanraden. 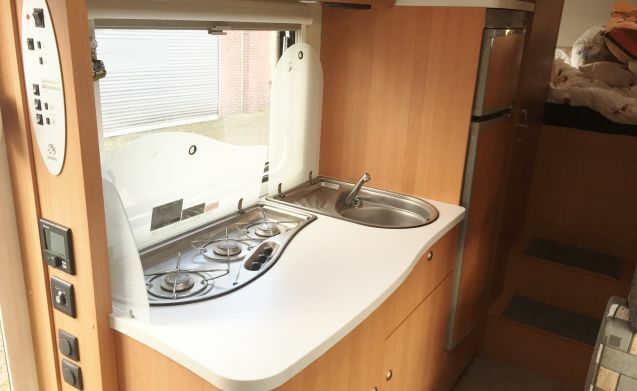 We wensen jullie nog veel mooie campertochten toe! Response from Fam. Paul stuurd ons ook nog het volgend bericht: Hoi, Mijn recensie was nog niet helemaal af. Ik weet niet hoe je het nog kan toevoegen, maar ik wou nog iets schrijven als: "De Familie Kellerhuis is één en al hartelijkheid, en neemt alle tijd voor je om dingen uit te leggen. 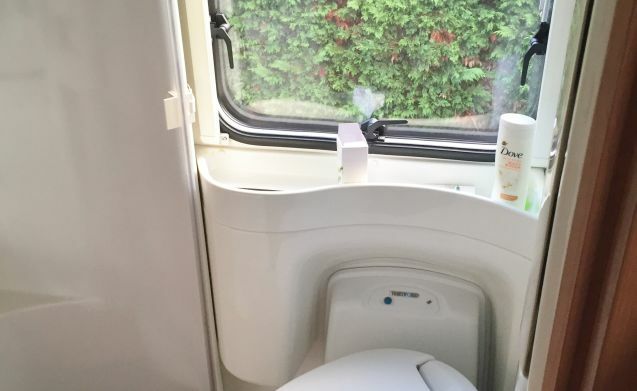 We hebben even proef mogen rijden om even aan de grootte van de camper te wennen. Ook de tijd die ze namen om onze verhalen in ontvangst te nemen was in één woord geweldig, super bedankt". Onze reactie: we zitten hier te blozen, dankjulliewel! Bij het deelnemen aan GoBoony hebben ze ons 1 ding vergeten te vertellen: hoe ontzettend leuk het is om nieuwe mensen te ontmoeten, allemaal even enthousiast en lekker positief over alles. We hopen jullie volgend jaar weet terug te zien! 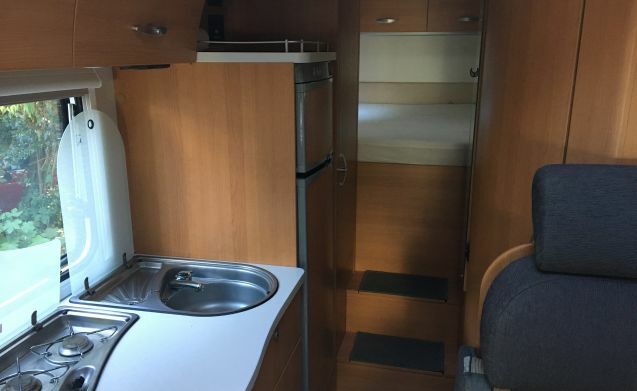 For rent, luxury camper with all amenities!